So your area is currently under a fire ban, and you have to temporarily take a break from kumbaya-ing by the campfire? I guess that means it’s time to give up on fun and park it indoors for the remainder of the summer. Wrong! While summer is heating up, so is the risk of starting an accidental fire. That doesn’t mean you have to stop living it just means you need to be responsible. Our selection of fire pits and fire tables are a safe alternative to traditional campfires that will keep you roasting s’mores all summer long. Fire bans are geographical restrictions that determine where you are allowed to have a wood or charcoal campfire. Camp Chef propane fire pits are approved under most fire ban restricted areas; however, be sure to check local fire ban details before use. Campfire restrictions are put into place to lower the risk of wildfires. When fires break out, they can cause hundreds of thousands of dollars to contain and cause irreparable damage to some of your favorite landscapes. These bans are especially common in dry climates and as we near the hottest portion of the summer, we can expect these bans to become more and more prevalent. Propane powered fire pits and fire tables are a great alternative to experiencing all the niceties of traditional campfires without having to worry about campfire restrictions. If you learned anything in scouts, it’s how to set things on fire. 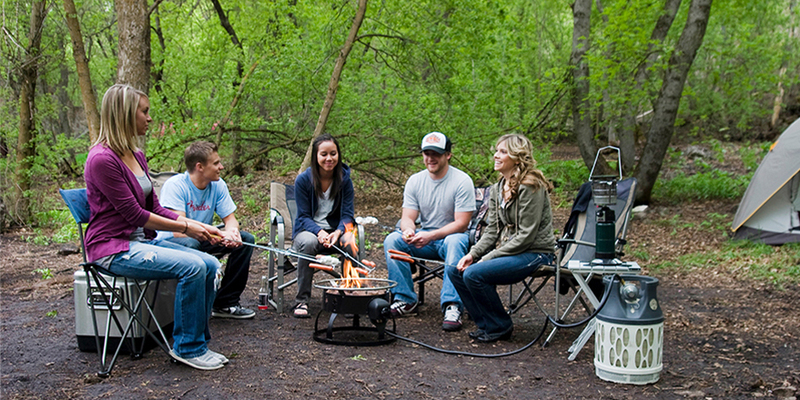 With Camp Chef’s propane powered fires you don’t have to worry about “questionable practices” or choosing between the teepee or log cabin method when starting your fire. Just turn on the gas and spark your fire seamlessly and pain-free. Windy conditions and damp wood are no longer an issue when trying to ignite your fire. Enjoy a consistent and reliable flame every time with any of our fire pits or fire tables. Natural wood fires are unpredictable and often have minds of their own. Propane fires are easy to adjust and allow you to control your flame so you can seamlessly switch from bonfire to mood-lighting in a snap! Propane burns much cleaner than wood and doesn’t produce near the amount of smoke. Avoid smoke-soaked clothes and watery eyes with a clean burning alternative. Thanks for the feedback and for being a member of our Camp Chef family!